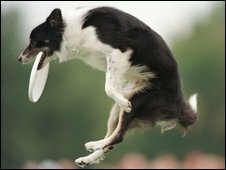 The man who invented the Frisbee, one of the world's most popular toys, has died at his home in Utah aged 90. 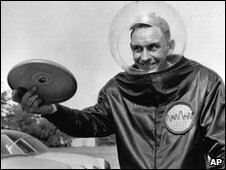 Walter Frederick Morrison conceived and developed his aerodynamic plastic disc in the 1950s, and hundreds of millions have been sold worldwide since. Frisbee historian Phil Kennedy said Mr Morrison and his future wife, Lu, got the idea from playing with a metal cake pan on the beach in California. He originally called his toy the Pluto Platter and sold it at local fairs. The platter's novel aerodynamic shape allowed it to hover briefly or travel surprisingly long distances, kept aloft by its rotation. In 1957 Mr Morrison sold the rights to the California firm Wham-O, which discovered that youngsters were calling the toy a "Frisbie" after the name of a well-known pie. The company changed the spelling to avoid trademark infringement and the Frisbee was born. On the official Frisbee website, Wham-O paid tribute to Mr Morrison, who was known as Fred. "As Frisbee discs keep flying though the air, bringing smiles to faces, Fred's spirit lives on. Smooth flights, Fred," it read. Mr Morrison's son, Walt, told the Associated Press that his father had suffered from cancer, and that "old age had caught up" with him. How would you get through your youth without learning to throw a Frisbee? "He was a nice guy. He helped a lot of people. He was an entrepreneur. He was always looking for something to do," he added. Lawyer Kay McIff, who represented Mr Morrison in a royalties case, said: "That simple little toy has permeated every continent in every country. As many homes have Frisbees as any other device ever invented. "How would you get through your youth without learning to throw a Frisbee?" Mr Morrison, who died at his home in Monroe, on Tuesday, is survived by three children. Walt Morrison said the family planned to hold a memorial service on Saturday at the Cowboy Corral in Elsinore, Utah.